Enrolled Agent Exam Scoring: What Does the EA Exam Score Mean? As with every other test, you need a certain score to pass the Enrolled Agent exam, also known as the Special Enrollment Exam (SEE). What the EA exam passing score is and how it’s calculated is all part of the Enrolled Agent exam grading system. 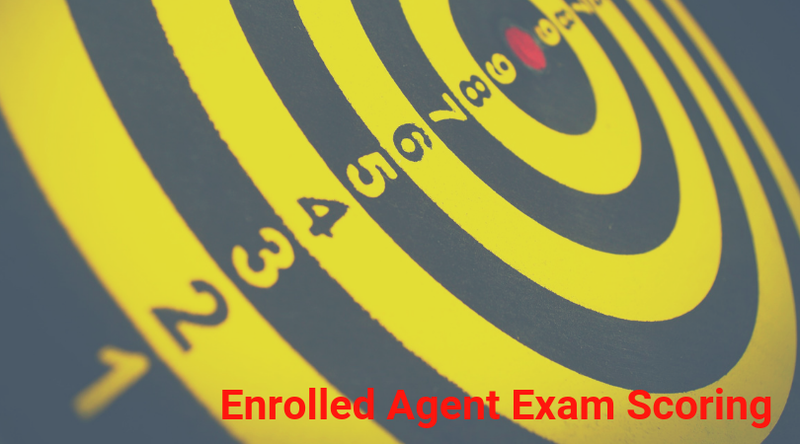 I’ll explain Enrolled Agent exam scoring in detail so you know more about what it takes to pass the exam, and I’ll even show you a sample scoring report. To recap the exam basics, the Enrolled Agent exam has 3 parts with 100 multiple-choice questions each. The exam weights each question equally. On the Enrolled Agent exam, 85 of the multiple-choice questions contribute to your EA score. The remaining 15 are experimental, so they don’t contribute to your score. The IRS has a large pool of questions it can use to build the EA exam, and a team of enrolled agents and members of the NAEA author these questions that will ultimately appear on your exams. The exam questions vary in degree of difficulty. The IRS determines the question difficulty levels by providing experimental questions to actual exam takers. For example, if many candidates correctly answer Question 1, the IRS categorizes Question 1 as an easier question. How much do you need to score to pass the Enrolled Agent exam? The scale for the EA exam score ranges from 40 to 130. The EA exam passing score is 105. The foundation of your EA score is the number of the 85 operational questions you answer correctly. The IRS mathematically transforms your number of correct answers to a standardized scaled score. The IRS doesn’t use a straightforward formula to achieve this conversion from raw to scaled score. So as much as some of you would like to know, I am not able to tell you how exactly this is done. If you reached the 105 enrolled agent passing score, you will receive immediate confirmation that you passed the exam (the testing center will print the results for you). However, you don’t get to know your actual score because the examiners don’t think it matters. Once you pass your first part of the enrolled agent exam, you have 2 years to complete and pass the remaining 2 parts before you lose credit for your first part. A 2-year carryover of your EA scores is generous and provides you with ample time to complete all 3 EA test parts. If you failed the EA exam, you’ll receive immediate notification of your result as well as additional information about your performance. You’ll get a score ranging from 40 to 104 so you can see how close you were to passing. A 103 means you were really close to passing, while a 70 indicates that there was a good amount of information you didn’t know. Level 1: Area of weakness where additional study is necessary. It is important for you to focus on this domain as you prepare to take the test again. You may want to consider taking a course or participating actively in a study group on this topic. Level 2: May need additional study. Level 3: Clearly demonstrated an understanding of the subject area. In this example, John Doe scored 102, which was pretty close to passing. Looking at the diagnostic indicators, he did pretty well in preliminary work, deduction/credits, and specialized returns. He should review the materials and work on more practice questions in the areas of income/assets and taxation/advice. You can get a score report just like this onsite immediately after the exam. You also will receive a printed score report in the mail within 60 days of the test date. When you get it, you can review Prometric’s additional information about understanding your score report. Knowing how the IRS scores the EA exam and seeing a sample score report can help you understand the high expectations of comprehension and skill the EA exam has for you. Don’t get discouraged by this information; instead, use it as motivation to make the most of your study time every day leading up to your exam date. When you commit to studying well and give it your all from the start, you can pass on your first try and never even see a report like the one above with your name on it. If you’re still in the initial stages of your EA journey, learn how to become an Enrolled Agent from my 10-step guide. Discover the Enrolled Agent exam dates and deadlines so you can make your study schedule, and if you have any additional questions, contact me. I’m here to help, and I wish you the best on the EA exam! I passed all three parts of EA, however I didn’t receive score report for Part 1 after exam. I passed part 1 three months back. Can anyone please advice how to get it? Congratulations on passing! You won’t receive a score report unless you failed. 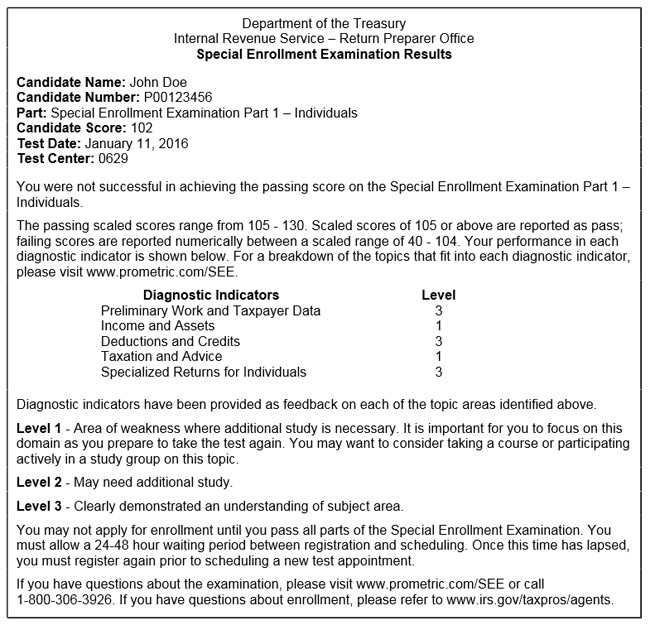 You do receive confirmation of passing, but a score is not reported. Please learn more about EA scores here. Note: this is the article you posted your comment on, but I wanted you to know that all the info is contained within in case you don’t have the page bookmarked. Once you’ve passed the first exam, is there a time limit on passing additional exams? That’s a great question, Lavonda! You need to pass the next two parts within two years of passing the first part, otherwise, you’ll lose credit for the first part.